A trade card was an advertisement, as well as a business card. It was also often used by the tradesman as a bill or receipt. This one is inscribed with a bill on the back and dated 'May 20 1764'. William Hussey (active 1764) was a retailer and a dealer in porcelain. Such tradesmen were known as 'Chinamen'. They marketed their wares to the public, to export merchants and to other dealers. They usually sold a large range of ceramics including English china, Staffordshire pottery and Chinese porcelain, as well as glasswares and other luxury goods. On this trade card William Hussey advertises that he sells 'Japan Dressing Boxes for Ladies Toilets'. The term 'Japan' was used to refer to all lacquer goods, not only those from Japan. The trade card has been decorated with Chinoiserie motifs. They include the two figures at the top, one with a pigtail, and the pagodas hung with bells. There is also a representation of a Chinese-style porcelain jar. 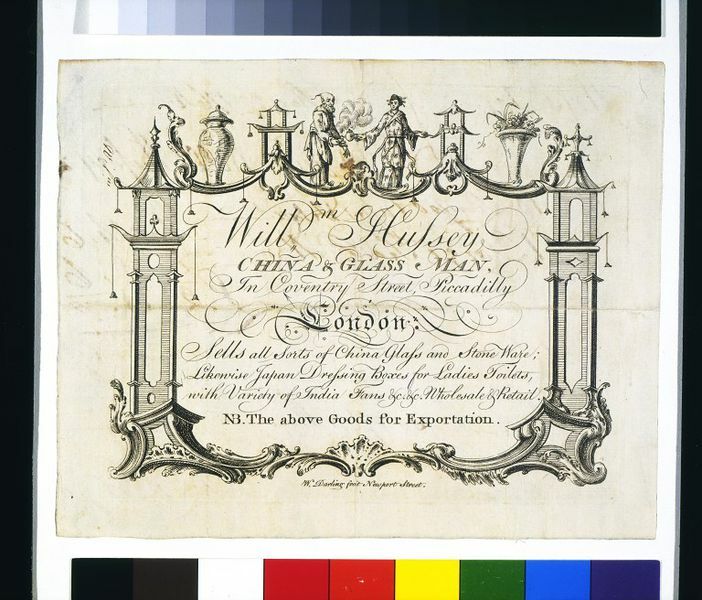 Perhaps this style of decoration was chosen to emphasise the luxury aspect of William Hussey's trade, as well as advertise his stocks of expensive goods from East Asia. Bill-head or trade card, engraving and letterpress. William Darling. 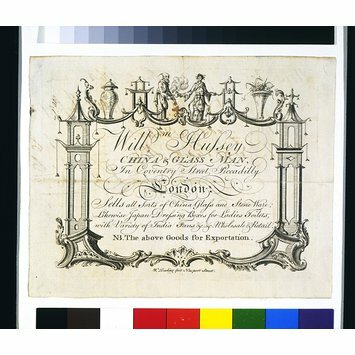 Engraved trade card for William Hussey, a London china and glass merchant and importer of Asian goods. Victoria and Albert Museum, Department of Engraving, Illustration and Design and Department of Paintings, Accessions 1943, London: HMSO, 1956.